SanMar® decorators, welcome and thank you for visiting Essent®, the leading technology solutions provider for the promotional products and imprinted apparel industries. Essent provides integrated, end-to-end technology solutions for distributors, decorators, and suppliers, offering comprehensive business management solutions that process more than $3 billion in commerce annually. SanMar decorators including Pack Separately Ship Together (PSST) members, Contract Decorators, and Promotional Product Distributors (PPDs) know the value of operational efficiency for more profitable relationships. Essent takes operational efficiency and profitable relationships to the next level. 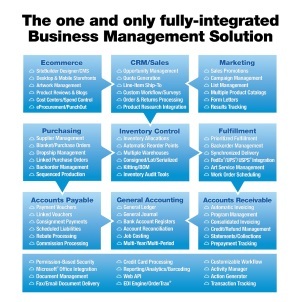 Compass™, the one and only fully-integrated Business Management System designed for the unique needs of distributors, decorators, and suppliers. SiteBuilder™, to maintain a powerful web storefront that can integrate with the SanMar product catalog. The industry-standard OrderTrax® Network, for real-time, electronic communication with your trading partners. All three leverage the integrated Essent Product Configuration Engine to help ensure that orders follow trading partners’ business rules and industry standards to generate Well-Formed Orders™ for efficient, cost-effective processing. Essent technologies provide a fully-integrated, automated, scalable solution for more efficient, more profitable relationships with your business partners. Contact Essent to learn more. Fill out the form below and an Essent representative will reach out to you shortly.